The control panel is on the right side of your screen. This section is where you may select charts, change preferences, make trades, and much more. Each tab of the control panel has a specific purpose which is outlined in the sections below. Quote Window: This will display the live quotes stream coming directly from the clearing house. The graph will display the Bid in red, the Ask in green, and the Last in white. The top of the Quote Window will display the current contract symbol, the Bid(sell) price, the Ask(buy) price, and the Last(most recent) price. The bottom of the Quote Window labels your current Spread(distance between bid/ask price), the Avg(Average) spread since opening this chart, the High, or largest spread since opening this chart, and the Low, or smallest spread since opening this chart. Chart Open P/L: Will display your currently profit/loss(P/L) for contracts held in this specific symbol only. Total Open P/L: Displays your current profit/loss for all open contracts held in all symbols. Realized P/L: Displays your profit/loss for all trades that have closed. *Note: Chart, Total and Realized P/L will display in dollar ($) value by default. Left-click the blue dollar sign $ to change to %ROM(Percent Return on Margin), Tics/Pips, or %Total (total account percentage gain/loss). Portfolio Margin: Shows the currently used margin for all open contracts. You may left-click Maintenance which appears by default in blue to choose between viewing the Maintenance, Initial, or Day margin used. Usable Margin: Displays the quantity of contracts you could create along with the account balance you still have available. You may left-click Maintenance which appears by default in blue to choose between viewing the Maintenance, Initial, or Day margin used. Cash Balance: Balance available before closing currently open trades. Equity/Margin: Equity/Margin Ratio is calculated by dividing current Account Equity (Net Liquidation Value) by the Portfolio Initial Margin Amount. If you want to place a trade or hold open positions, the Equity-to-Margin ratio in your account must be greater than 5%. If the Equity/Margin ratio drops below 5%, or the Account Equity drops below $500 (whichever comes first), your account may be locked by the clearing firm and/or open positions may be liquidated by the clearing firm in an attempt to prevent the account balance going negative. Account Equity: Current account value including the dollar value of all open trades. Long, Short, T-Long, T-Short: Will display the number of long or short contracts open in this symbol, or the total number of long or short orders (T-Long/T-Short) in all markets. PnL/Tic: Displays the dollar value of each minimum move (tic/pip) for this open symbol. Day margin will also be listed as a quick reference. Order Qty: Here you select how many contracts you wish to create while using any of the order creation buttons listed below. You may type the order quantity into the window, click the up/down arrows to incrementally change the quantity, or you may click the quick order quantity buttons: 1 / 3 / 5 / 10 / 15/ 20. Quick Custom Orders: Filled by default with market or stop/limit entry orders which already have a profit taking and stop loss order attached. Left-click the Q-OCO 1 or Q-OCO 2 button to create a new market order with attached OCO(one cancels other) orders. Select Q-OCO 3 or Q-OCO 4 to attach a stop/limit order to your cursor with an attached profit-taking limit and stop-loss order. Once selected, click within the chart window to create the new order. To edit the default Quick Custom Orders, right-click on the Q-OCO button you want to customize. From this window, you may select to Edit a previously created Q-OCO order, or you may Add New to create a new Q-OCO order. Futures users may copy all Quick Custom Orders to their Spreads Tab from this same right-click window. You may name or rename your Quick Custom Order to anything that you like, but it is recommended to include the order type and stop/limit values so that you may see your order type quickly at a glance when using the Q-OCO buttons. If you want this order to appear by default for the selected Q-OCO button each time you open Track 'n Trade, make it your default custom OCO strategy by checking the box. The Order Type will decide the entry order method. The stop count and limit count values will determine the distance away from your entry order that your stop loss and profit taking orders are created in tics/pips. For more information about stop-loss customization, see the Place Order Button section . Remove will delete this custom order from your Q-OCO menu. To choose between multiple saved Quick Custom Orders, left-click the order name and select your desired custom order from the drop-down window. The Order Placement Tool is used to place custom orders on the chart. Left-click on the red and green Buy/Sell button and then move your cursor into the chart window. The order is not placed until you left-click in the chart window and confirm the order from the Order Placement dialog. Note: to denote the Order Placement tool is in effect, the mouse's icon will change to an arrow. This tool is also found in the Drawing Tools toolbar that runs across the top of the software. To bring up the Order Placement dialog first select the Place Order button, then click in the chart approximately where you would like the order placed. At the top of the dialog, it will reflect the Contract/Currency Pair along with the rate at which the order was initially placed. 1. Order Details: Choose whether the order will be a Buy/Sell, what quantity (Qty. ), Order Type, and the Rate. Buy/Sell: Choose the appropriate radio button. Qty: Either type in the quantity or use the up and down arrows. Market Order (MKT): A market order does not specify a price; it is executed at the best possible price available. A market order can keep you from 'chasing' a market. Market If Touched (MIT): Similar to a limit order, orders to buy are placed below the current price; orders to sell are placed above the current price. MIT orders fill once the limit price is touched or passed through. (Some exchanges do not allow MIT orders). Limit Order (LMT): Limit Orders to buy are placed below the current price; limit orders to sell are placed above the current price. The market may touch a limit price several times, without filling. In most cases, the market must trade better than the limit for the order to fill. Stop Order (STP): Place a buy stop order above the market price; place a sell stop order below the market price. A stop order becomes a Market Order when the specified price is reached. Close Stop Order (C_STP): Place a buy close stop order above the market price; place a sell close stop order below the market price. A close stop order can only be a local order. A close stop order becomes a Market Order when the specified price is reached and the market closes lower(sell) or higher(buy) at the close of the bar. Rate: When using a non-Market Order type, you can further adjust and edit your rate. 2. Trail: Make a Stop or Close Stop Order a trailing Stop or trailing Close Stop. Choose the trailing type in the drop-down menu and use the text box for the corresponding value of the trailing type. % Open Profit: The stop order will trail the percentage specified times the profit of all open orders of the current symbol. In summary at (Percentage /100) * (Profit of Open Orders on this symbol). If the Open Orders Profit/Loss total is at a loss the stop will not trail. $ Behind: The stop order will trail at the specified dollar amount. # Price Bars: The stop order will trail at the highest high or lowest low within the specified amount of bars. A filter can be applied called Filter Lower, Highs / Higher, Lows. See below at number 4. ATR Stop: The stop order will trail at the Average True Range Stop dots. Turn on the ATR Stop overlay to see where they are on the chart. PSAR: The stop order will trail at the Parabolic Stop and Reverse dots. Turn on the Parabolic SAR overlay to see where they are on the chart. Zig Zag: The stop order will trail at the Retracement Target. Turn on the Zig Zag overlay to see where it is on the chart. BNB Blue Light: The stop order will trail at the Bulls n Bear Blue Light dots. Turn on the Bulls n Bears Blue Lights to see where it is on the chart. To do this go to the Preferences of Bulls n Bears and in the drop down under Blue Light choose Bullish/Bearish or Both. Tics/Pips Behind: The stop order will trail at the specified number of tics/pips. 3. Trail Until Breakeven: This will enable your stop loss to trail until it reaches the price level of your entry order. Your stop order will then stop trailing and stay active at the break-even price level. 4. Filter Lower, Highs/Higher, Lows: This is a filter associated with the trailing Bars Back selection. This filter tells Track 'n Trade to only advance the trailing stop if the price bar makes a higher high on a long position or a lower low on a short position. 5. Limit and Stop (can be OCO): This will add a stop or limit at the number of tics/pips specified above or below the market (depends on the type of position). These will become a one cancels other (OCO) order when a stop and a limit are both selected. 6. Jump Stop: This will have the stop jump to a new tics/pips from breakeven (this can be negative to have it a certain tics/pips back from breakeven) after the market has moved favorably the specified tics/pips. This feature can be used when the order type at section 1 is a stop to make the first order to jump, or if using a stop in section 5 it makes that stop jump. 7. Trail Stop: This will enable the stop in section 5 to trail using the same features outlined in section 2. 8. Good 'til Cancel: This enables the order to be active until the user decides to cancel the order. If it is checked off the order will expire at the end of the trading day. The Time Release Order Placement Button will appear within your Trade Tab as a clock face. To create a time-released order, simply left-click this button. Once you have selected the Time Release Order Button, you may select to create a Buy or Sell order by selecting the bullet point in front of Buy or Sell. Adjust your order quantity(Qty) by entering the number directly within the Qty window, or by clicking up or down in the Qty window. The Order Type will appear as a Market (MKT) order by default, with your current market price shown within the Rate window. Check the box in front of Release to create your order placement timer. You may then select what calendar date and time to place the trade in your market. *Note - Orders must have a release time during market hours to be accepted by the clearing house. Check your Key Tab for market hours and ensure that you are placing the trade during regular trading hours. Click OK to create the order within your chart. Cancel will be used to cancel orders that do not fill after a certain period of time. This will primarily be used with the addition of stop and limit entry orders in the near future. This section details how to adjust the appearance of orders, OCO's, and filled positions within your chart window. To adjust your order appearance, right-click any order/position triangle and select Properties. Order: An unfilled stop or limit order. One Cancels Other (OCO): Stop/Limit order attached to an entry order. When one stop/limit is triggered, the other stop/limit is canceled. Position: Once an order fills, it becomes an open position. Filled Order Outline Color: Adjusts the triangle color outline after order fills. Left: Display order text to the left of the order triangle. Dependent on space requirements. Font Size, Type, Color: Adjust the text size, font, and text color. What information would you like displayed? : Check each item that you would like to have included with your onscreen text and if you would like values displayed in dollars ($), percent (%) or tics/pips. Position Lines: Display filled order position line, filled position lines and order triangle. Position Line Text: Select whether to Show Text, have text display on the right or left-hand side of the position line. What Position Information would you like displayed? : Display position line text for order details. Check each item that you would like to have included with your onscreen text and if you would like values displayed in dollars ($), percent (%) or tics/pips. The DOM or Depth of Market is comprised of a multi-colored, multi-column trading tool, where the user can see a sliding scale of market prices and trading activity. On either side of the market price scale, are columns, one representing the Bid, and the other representing the Ask. The Bid, or Sell side of the market is represented in Red, and the Ask side, or Buy side of the market is represented in green. The numbers listed within these columns display the number of trades waiting at each price. The numbers seen at the bottom total the values in the columns. The market Volume column is on the far right of the price ladder, and represents the volume of contracts traded at that price, throughout that particular trading session, and highlights in blue the volume as a chart. You may create trades directly from your DOM. Double-click a line within the Bid/Sell column to create a sell order at that specific price. Double-click a line within the Ask/Buy column to create a buy order at that specific price. Order quantity is determined by the Order Qty section directly above the DOM. The bottom of the Quote Window labels your current Spread(distance between bid/ask price), the Avg(Average) spread since opening this chart, the High or largest spread since opening this chart, and the Low or smallest spread since opening this chart. Usable Margin: Displays the quantity of contracts you can create, along with the account balance you still have available. You may left-click Maintenance which appears by default in blue to choose between viewing the Maintenance, Initial, or Day margin used. Order Qty: Here you select how many contracts you wish to create while using any of the order creation buttons listed below and while creating trades within the DOM. You may type the order quantity into the window, click the up/down arrows to incrementally change the quantity or you may click the quick order quantity buttons: 1 / 3 / 5 / 10 / 15/ 20. Exit ALL: Panic button or just to end trading for the day, Exit ALL will close all orders(pending and open), across all markets, immediately. The Preferences Tab is used to display the settings of the currently selected feature of the software. Once the Preferences Tab has been opened, left-clicking on any chart, tool, or indicator will immediately show the preferences for the selected item. When you click on the chart with the Preferences Tab open, the Chart Preferences will appear. You can also right-click on the chart and select Chart Preferences. This is used to control how your chart looks. You can change your price bar style and color, background color, scaling, and even control time intervals. You can also choose to have different styles for each chart or apply your favorite chart style to all your charts. Restore Settings: TNT Default will change your settings back to the original software settings. My Default will change current settings to your personalized default settings. Apply To All Charts will apply your selected settings on all open charts. Save As My Default will save your current settings to your personalized default settings. Chart Type: Sets the time interval each price bar will represent. You will have different grid options depending on what chart type you choose. *Forex only: Drop-down menu next to the Chart Type to set the price bar according to the bid/ask. Price Bar Type: Choose what information you want your price bar to include. -OHLC: Open, high, low, and close. -HLC: High, low, and close. -Close: Close price only. Plotted as a line. -Open: Open price only. Plotted as a line. Grid Period: Sets vertical grid lines at specific intervals. For example, if you have selected a 5, 10, 15, 30, or 60-minute chart type your grid period settings will be limited to hourly, daily, or periodic. However, if you select a daily, weekly, or monthly chart type your grid period settings will be open to select any day of the week or month. You can also set your grid line to show daily, or at the beginning of each month, as well as select to show them periodic. Price Scale: Sets the amount of horizontal price grid lines you see on your chart, these are equally spaced. If you want to see price grid lines at set intervals, uncheck Fixed, then select what price increments you want your grid. Chart Scale: Linear will keep your grid lines evenly distributed. Logarithmic will continually decrease the amount of space between horizontal grid lines as the price goes up. Auto Vertical Scale keeps the price bars vertically centered on your chart. Font: Change the font and size of the text on the ruler. Ruler/Text Color: Change the background and text color of the ruler. Location Lines: Change the line style and thickness of your ruler lines. Cursor, Last Price, Buy/Sell: Select if you would like to see cursor location lines, the last price line, or buy and sell price lines on your chart, and what color you would like them to be. Grid Lines: Change the color of the horizontal and vertical grid lines. Background: Change the chart background color. Close: shade them according to the close compared to the previous close price. Alt Days: (alternating days) shade them by odd and even days. Highlight: Choose between highlighting the price bar you are over or highlighting the entire day (bar) you are over. Hold down shift to quickly switch to the other option while your mouse is over the chart. Change the font, size, and style of the text displayed onscreen for the overlays, indicators, and OHLC text. OHLC Text: Choose the color for the OHLC text. Expiration Date Lines: [Futures Only] Choose the color of the Market Close, Contract Expiration, First Notice, and Options Expiration timelines. 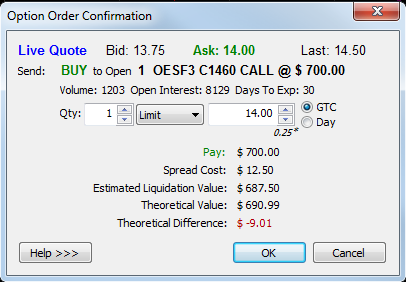 Putting a check in the Options Expirations will show all options expiration times for that chart contract. The Options tab may be viewed from the Control Panel on the right-hand side of the software. The Tab will appear as 'Options' with a turquoise and purple up/down arrow. You will have access to create new buy/sell call and put options using the Buy/Sell CALL and Buy/Sell PUT buttons. You may close this charts options by selecting the Exit CHART Opts button. To close all options orders, select Exit ALL Opts. Your options contract month may be selected in the drop-down window provided left of the Int Rate (Interest Rate) button. Use this Window to choose your chosen option contract month. Bolded contracts are monthly options. The lower section of the Options Tab will show you the current market values for each available Strike price. Puts and Calls are colored to match filled option orders on the chart. Options at the money are displayed in a different color that correlates to the Bid/Ask lines color of Chart Preferences. You may also place orders using this window by right-clicking on your desired Strike level. Columns: There are many columns in the Strike Price window for further Options analysis. Making the Options Tab wider will reveal these, or right-click on column titles and choose Column Setup. This will show the Options Strikes Table Column Chooser which includes short descriptions of each column and the option to turn on or off each of the columns. Puts, Calls, Both, ITM or OTM: Use this feature to the right of the Option Qty buttons to toggle the Strike Price window to show only Puts, Calls, Both puts and calls, In The Money options (puts and calls), or Out of The Money options. Options will fill by default at the current Bid/Ask (fastest fill). You may change this default to instead fill at the Bid/Ask Midpoint (better price). To apply this setting, right-click a Buy/Sell Call/Put button in the Options tab. The window on the left will appear and you may change to use the Midpoint price instead. You may also right-click the Exit CHART Opts and Exit ALL Opts to adjust this same feature for exiting trades. In order to load your options order preferences, right-click an options order diamond you have placed in your chart and select Properties. There are three separate types of options orders. Options preferences are broken into these three separate sections. A Regular Option, a Pending-To-Close Option, and a To-Be-Closed(Original) Option. The first section of the options preferences will be dedicated to a regular option order placed within the chart window. An example of a regular option order would be placing a Buy Call which fills above your market. You may customize colors based on whether it is a bought or sold option along with if it is a call or put option. You will also be able to choose what on-screen text would be included with these trades. You can add descriptions which are as varied as Expiration, Premium, Volume. Will apply to any text descriptions that are added directly to the option line, which will appear locked on the left-hand side of your chart window. Will apply to any text descriptions which are attached directly to the options original diamond location. 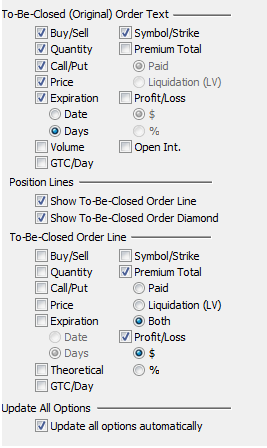 When you decide to liquidate an option, you can right-click on that option diamond and click Liquidate to create a new Pending-To-Close order. If this order fills immediately, your options will close and no longer appear in the chart. However, if this new option does not immediately trigger from possibly a custom limit, then a new Pending-To-Close trade will be placed over the top of your To-Be-Closed Option. By default, this pending order will appear in yellow, and it too will have appearance preferences that you may customize in the chart window. 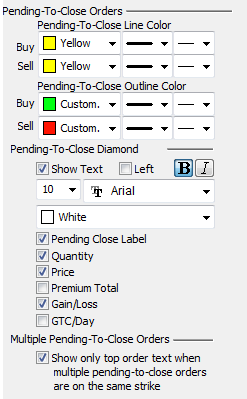 If you would like to see the To-Be-Closed(Original) Options in your chart window and it is being covered by a Pending-To-Close order, right-click on the yellow pending order's diamond and choose to Send to Back. Once this Pending-To-Close order is sent to the background, you will see your original options order, which will now be displayed using the To-Be-Closed(Original) Order Text preferences. It is this preferences section shown to the right that applies to To-Be-Closed(Original) Options. Name: Name of the commodity. Symbol/Base Symbol: Gecko Software's symbol for the commodity. Type: The type is a category for commodities. Contract Size: Number of units that one contract represents. Contract Units: The unit of measurement. Tic Units: The unit of measure for quotes. This unit should be the same as the unit that the Exchange uses. Minimum Move: The smallest increment the quote of a contract will fluctuate (a tic). Exchange: The exchange is where the commodity's trades are processed. Expiration/First Notice Date: Displays the important dates of the contract. Includes a link to the exchange about it. Initial Margin: The required amount per contract you must have in your account to carry the open position from the current trading session (in which you opened the position) into the next trading session. Open and Close Times: Lists the Open and Close times for this contract in your time zone as listed in the File menu at Manage Time Zone. Full Point movement: Below the table, the software shows how to calculate a full point movement. This value represents what a move in the one's place is worth. The Data Tab will show you the data for your current chart. It will give you the open price, close price, high price, and low price of the bars. It will also show the volume traded. You have the option to print the data for your records or export the data for use another way. Under displayed data, it will show the values for indicators or overlays that are currently on the chart. You may need to widen the control panel to see this. In Futures, you can choose the CoT Data to see the details of the data for the Commitment of Traders indicator (only if you have the Commitment of Traders Plugin). The Notes tab is for you to keep notes on the charts that are saved within your chartbook. Each chart has a new Notes section available to keep notes for that particular chart. You can also put text right onto the chart using the text tool, you can find more information about that in Toolbars -> Standard Tools -> Text Tool . The Accounting Control Panel will appear in the lower left-hand corner of your Track 'n Trade Live software. The Autopilot button may be selected to switch to the Autopilot Control Panel. You may return from the Autopilot by selecting the Accounting button in the same location. The Start Trading button is used by the Autopilot to begin automated live trading. It is not necessary to click this button before manually trading any market. Account Number: Will list which account you are currently trading. You may select the account name to toggle between multiple accounts when available. The Account Number listed will determine which account you are currently trading within Track 'n Trade. Account Statement: Select this button to view your Account Statement online. This is available only while viewing a real money trading account. Pending Orders: Will display all orders which have not yet filled. This will include unfilled stop/limit orders, time release orders, and OCO orders. Open Positions: Will display all positions which are filled and actively being traded within your account. Closed Positions: Will display all positions which were filled and then closed out of the market. This section will also display any orders which were rejected by the clearing house. Track 'n Trade will store your closed orders information for as long as the software remains open. If you close and reopen Track 'n Trade, you will only see all closed orders since the previous market close. You may filter your trades list by right-clicking on any chart column such as Symbol, Name. The default Filter: Show all will display orders from all contracts. Your next option will be to display only the trades for the chart opened in the chart window. The last Filter option will show all trades for the base symbol, and not just the contract opened within the chart window. The "Current" options will determine how you want the Current column to list the market price. The Column Chooser (*Futures only) may be selected to alter which columns are displayed within the Accounting Control Panel for that specific Pending, Open or Closed Orders section. The Orders Column Chooser window includes a description of each column available, along with a check-box to activate/deactivate each. After editing your list, click OK to save your new default Columns.